Spicy marinade with ground black pepper, black mustard seeds and dried curry leaves. Chicken 65 is a spicy streetfood favourite in Southern India - but its name remains a mystery: whether the '65' refers to the year of its invention or number of ingredients in the original recipe. 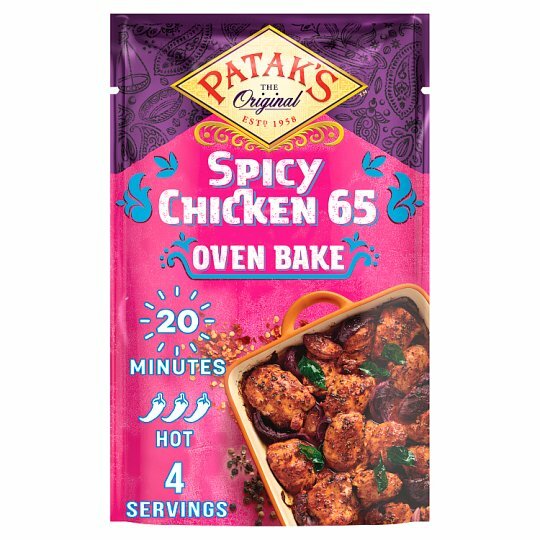 Patak's new Spicy Chicken 65 Oven Bake is a quick & easy marinade allowing you to easily discover why this delicious, fiery blend of herbs & spices is so popular in India. Store in a cool, dry place., Once opened keep refrigerated and consume within 3 days. Oven cook (From Chilled): Make sure your oven is hot by preheating to 200C/Gas mark 6. Cover the chicken thigh pieces and the red onion with the contents of the sachet. Place onto a large foil-lined baking tray or oven dish and bake in the pre-heated oven for 20 minutes, or until the chicken is cooked through. Delicious served with rice, in a naan or wrap, or with a fresh salad. Serves up to 4. For an even richer flavour, marinade in the fridge for up to 2 hours before cooking. Also delicious with chicken breast, or for a vegetarian option swap out the chicken for cauliflower or paneer to create the South Indian vegetarian favourites- 'Gobi 65' and 'Paneer 65'.